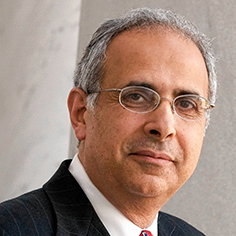 John Zogby, founder of the “Zogby Poll” and the Zogby companies, is an internationally respected pollster, opinion leader and best-selling author. He has joined with his sons Benjamin and Jeremy in a new company called John Zogby Strategies, a strategic visioning firm specializing in preparing companies and agencies for the coming wave of dynamic changes. A much sought-after speaker, he is represented by the American Program Bureau of Boston. Zogby is also the inaugural Director of the Keenan Center for Entrepreneurship at his alma mater, Le Moyne College. “All hail Zogby, the maverick predictor,” decreed The Washington Post, when John Zogby called the 1996 presidential election with pinpoint accuracy. And he did it again in the following two elections. His presidential polling remains among the most accurate through five elections. He has served as an on-air election analyst for NBC News, BBC, CBC, ABC (Australia), and has been featured by the Foreign Press Center in Washington every election night since 1998. He has polled and consulted for a wide spectrum of business, media, government and political groups including Coca-Cola, Microsoft, CISCO Systems, St. Jude’s Children’s Research Hospital and the US Census Bureau. A well-known political and social pundit, his work has been featured in op-ed pages worldwide, valued in corporate boardrooms and considered “must-read” at every level of America’s political landscape. His newest book, published in 2016, is entitled We Are Many, We Are One: Neo-Tribes and Tribal Analytics in 21st Century America, is an exploration of the American people from the vantage point of their attributes and values, not demographics or geography.